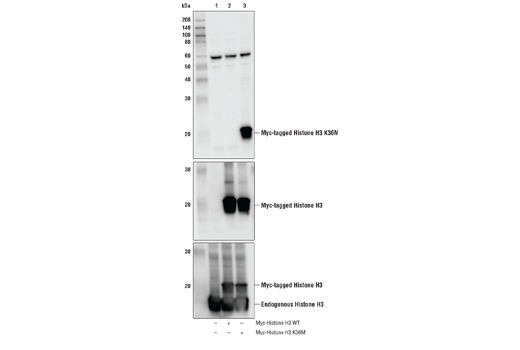 Western blot analysis of extracts from 293T cells, either mock transfected (-) or transfected (+) with Myc-tagged wild-type histone H3 (Myc-Histone H3 WT) or Myc-tagged K36M mutant histone H3 (Myc-Histone H3 K36M), using Histone H3 (K36M Mutant Specific) Antibody (upper), Myc-Tag (71D10) Rabbit mAb #2278 (middle), and Histone H3 (D1H2) XP® Rabbit mAb #4499 (lower). As expected, the Histone H3 (K36M Mutant Specific) Antibody only detects the Myc-tagged K36M mutant histone H3 protein and not the Myc-tagged wild-type histone H3 or endogenous wild-type histone H3 proteins. This antibody does detect endogenous levels of K36M mutant histone H3 protein. Histone H3 (K36M Mutant Specific) Antibody recognizes endogenous levels of K36M mutant histone H3.1, H3.2, and H3.3 proteins. The antibody may show slight cross-reactivity with wild-type histone H3.1, 3.2, or 3.3 when used at a high concentration. Careful titration of this antibody may be required to obtain optimal specificity. Polyclonal antibodies are produced by immunizing animals with a synthetic peptide corresponding to K36M mutant sequence of human histone H3.3 protein. Antibodies are purified by protein A and peptide affinity chromatography. Chondroblastoma is a rare type of benign tumor that is found at the rounded ends of the long bones in the arms and legs. More than 90% of chondroblastomas have been found to contain a heterozygous mutation in the H3F3A gene encoding the histone variant H3.3 (1). This mutation, a lysine to methionine amino acid substitution in codon 36 (K36M), inhibits at least two histone H3 lysine 36 methyltransferases, WHSC1 (MMSET) and SETD2, resulting in the reduction of global levels of histone H3 lysine 36 methylation (1). Chondrocytes containing the histone H3 K36M mutation exhibit several hallmarks of cancer cells, including increased ability to form colonies, resistance to apoptosis, and defects in differentiation. Reduction of global methylation levels in chondrocytes, resulting from the K36M mutation, contributes to tumorigenesis by altering the expression of cancer-associated genes. The histone H3 K36M mutation is also found to promote sarcomagenesis by impairing the differentiation of mesenchymal progenitor cells, resulting in undifferentiated sarcomas (2). The K36M mutation alters the histone methylation landscape, resulting in a genome-wide gain in histone H3 lysine 27 methylation and redistribution of polycomb respressive complex 1 and derepression of its target genes known to block mesenchymal differentiation. Finally, the histone H3 K36M mutation is also found in 13% of HPV-negative head and neck squamous cell carinomas, again contributing to tumorigenesis by altering global methylation levels of histone H3 lysine 36 (3). Lu, C. et al. (2016) Science 352, 844-9. Papillon-Cavanagh, S. et al. (2017) Nat Genet 49, 180-5.